I’ve been using Inventor for the past 11 years or so but only in the last 2 I’ve started using Tube and Pipe on daily bases. I’ve reviewed almost every tutorial, video, blog, existing on the matter but still find there are a lot of bugs, and room for improvement so during the course of one week while doing my daily job I’ve decided to add all the little things that got in the way of being more productive. It took another week to get the images and animations and to prepare the document but I am sure that even for non Tube and Pipe users this will make sense and cast a vote. I am not sure if it was better to split all these ideas into separate posts or keep it as one. I think that some of the requests have been mentioned before so I apologise for that but I thought to keep it all together hopping to rather get a general overhaul of the Tube and Pipe environment so please vote for it even if they seem duplicate (add links to other posts so we can vote them there as well, please). 1. If you don’t populate the route it can be really hard to place fittings. It doesn’t snap to nodes. Need to increase the snap influence area (or make the nodes bigger) so you can drop parts without populating the routes because this affects performance especially on large assemblies where we don’t populate until the very end. In the first part of the animation I am trying to place while in route only (or an unpopulated route) and it fails while with “populated” / ”display all objects” it’s really easy to drop fittings. Glyph and node custom size value needs implementing (nodes, arrows, etc), in T&P settings (template file) or even better in Inventor Settings customizable per user. I’ve seen a lot of requests from users of FEA and other modules as well for this. 2. Possibility to increase the arrow sizes (glyph) when routing or rotating from T&P settings (template file) or even better in Inventor Settings customizable per user. I hold the mouse over the arrow direction while typing an angle and I constantly need to increase the size to make sure the mouse doesn’t run away and that it stays on the arrow. 3. While in route you can’t delete multiple work features in Included Geometry, and you need to select and delete each one individually. This is very time consuming, and we need to be able to use delete on selected items. 4. When inserting a node into a route the newly created segments should try and maintain (copy maybe) the original segment’s constraints and dimensions. We only need to dimension the position of the newly inserted node in regard to existing geometry. Fully constrained sketches go crazy when inserting a single node, removing existing constraints and deleting dimensions in the process as well. 5. When placing fittings you get a rotation dialog but no “edit connection” or “change size” dialog. While in rotation mode an edit connection / change size should be available in the right click menu. You now need to start each command separately; you finish placing, select fitting, edit connection, select the fitting, change size, select fitting again, and so on in way too many steps. When you finish the Edit Connection /Change Size it should revert back to rotation mode dialog. I place similar fittings from adjacent runs because it’s easy but most of the time they are of different size and they need a different connecting dimension. 6. Not all commands have shortcut keys or can be assigned keys to them. I don’t use the ribbon, and we all like the keyboard shortcut keys so please have them all available. Some things I will mention: edit fitting orientation, edit fitting connections, change fitting diameter, restore fitting, finish route (read bellow on why go to parent CTRL+ENTER is not working) etc. All these commands are only available from the right click menu or ribbon making it time consuming to use. 7. Included geometry inside routes (planes, points) should have visibility off as soon as you exit the route. I haven’t found anyone that needs those visible once outside the route. You certainly don’t use them for “include geometry” in other routes. Turning the visibility from visibility menu / object visibility is not an option especially for large assemblies; we need proper off for each and every, not needing to manually change their state. I would not complain if you could turn multiple features off instead of one at a time as mentioned down bellow but even better turn them off automatically and let us turn them on if we want/need to once outside the routes. 8. Branches are an absolute must, tees or not. If the user doesn’t specifies a tee family in the style library (need to add a tee selection menu there) then pipes would intersect to simulate a welded connection. Notches in the larger pipe diameter should be added automatically if user settings “notch matching branches” in style selected, just like in the branch fitting author dialog. I’ve never used a cross (too expensive, company standard to avoid them) so I can’t advice on those but on tees if you have three lines with end points coincident, two of them collinear and third perpendicular (or 45 for Y) then that’s a tee connection. At least give us the option to connect them and manually place the tee, right now it complains about branches not being allowed, so you can’t connect nodes. My work around is to dimension nodes at a distance but the sketch is not fully constrained and the route segment can jump since more than one solution exists. 9. All routes need to be constrained and grounded at T&P origin to stop them from flying around. What’s the reason for not having it this way? Fittings inside the runs get connected around but the run itself never gets constrained, or moved around, individual routes are constrained by using include geometry. If needed the ground should be available to manually remove. Currently I am manually constraining the Tube and Pipe assembly and all the runs in it because if you move it by just a bit you’re pulling your hair wondering why it’s skewed. 10. When placing from content center the fittings default size selection should be the last used size, instead of defaulting to first item in the list every time. This way when you start placing fittings you only choose size first time, and the rest should follow. Different route? Different size? Then change size first placed item and the rest should follow again. I was going to suggest using the run size for each content center placed fitting but each run can have multiple routes each with its own size. 11. Allow multiple T&P assemblies to exist and to be editable in the same assembly. Each assembly can have only one Tube and Pipe subassembly, editable at one time, if you need to edit an assembly with multiple skids or multiple layouts (more than one T&P) assembly you can't at the moment. 12. When equipment moves (defer update, or changed outside main assembly) the routes go into “violation” mode where they turn pink, and all components of the route have visibility off. At this point the route is partially blocked for editing, you can delete constraints or segments but you can’t start a route in a different point or most important can’t insert nodes. I insert nodes to change direction, orientation and brake and fix routes but I need to do it before moving equipment predicting what might go wrong, or use undo, redo to bounce back and forward predicting how the change might affect the route. Deleting segments is not an option because the end points of the segments might hold fittings that get deleted in the process and need re-placing. 13. T&P equipment should change size dynamically. Each Content Center fitting (pipe, elbows, tees, etc.) should get the size from the previously item populated. If I drop a reducer in the line the rest of the fittings and segments items should change automatically (Prompt the user if he wants to change, the rest of the elements along the route). The limitation here would be that it works with Content Center and iparts only, not individual authored fittings, because they don’t have a family table to feed from so they will not change as the rest (they can’t). 14. Stop routes from jumping while dragging nodes. The only way to check if a route is fully constrained and movable segments is to drag random nodes and see if they are moving. Sometimes more than one solution error occurs when the route jumps on either side of a dimension. Use negative/positive dimensions like with planes, or positive along origin indicators and negative in opposite direction, or lock the dimension in place and allow a flip option on a right click contextual menu. Sometimes a route is fully constrained but because of more than one solution on these dimensions it doesn’t report or change colour to fully constrained, or even worse, when changing dimensions you end up with overlapping and intersecting segments which goes into “Route Violation”. 15. Pressing the “Return” or “Return to Parent” (CTRL+ENTER or CTRL+=) button will not exit the route environment, it will send you to 3D Sketch forcing you to press “CTRL+ENTER” again to exit route into run environment. Key shortcut for Finish Route is needed we don’t like to hunt for buttons on hidden menus ( I keep mine as Minimize to Tabs to increase display area). Sometimes when exiting the environment by using CTRL+ENTER twice doesn’t restore the visibility of the route components to on, so you need to select them all and turn them visible or edit the route and exit with the “finish route” button on the ribbon. 16. Multiple selection working commands. We need to be able to run regular commands on a selection set because right now you need to select each and every component to do stuff like: change size, edit fitting connection (to increase gap distance), make adaptive, etc. 17. Content Center pipes need re-authoring and ipart template should be set to “Participate in Assembly and Drawing Sections”. I’ve never wanted a pipe to run outside the section view but if I do I can turn off section participant for those ones. This needs to come in Inventor as default, not needing to republish standard CC libraries. 18. Tube and Pipe Content Center items don’t get the properties specified in the Content Center family template. I get no part number and no description all the time. Make it work like steel shapes, I am not getting Description or Part number from Content Center Pipes and Spools. 19. Include Route Centrelines in the drawing should show centreline for visible items only (use browser view to check which ones are visible). It’s showing for the whole Runs ending up with a lot of lines for which you need to turn visibility off, one by one. 21. 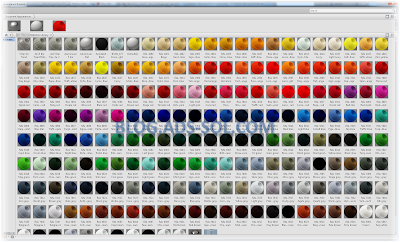 Changing size of multiple CC items has been approved, see here: http://forums.autodesk.com/t5/inventor-ideastation/tube-and-pipe-multiple-selection-change-size/idi-p/5355567. We need same ability for Pipes; if you select multiple pipes (in fact multiple items altogether, fittings and pipes) you should be able to use change size to modify them all as long as the families have same values for ND (or whatever they main key parameter is). If the only way of programming this into Inventor is by having same name for the key parameter on all T&P families (ND or whatever Autodesk decides) then I am ready to modify all my custom families in order to get this functionality going. 22. Last used Content Center family in Change Size should be cached in memory; it takes forever for the family size menu to show up again even if you just used it. 23. Can’t dynamically dimension using parameter names. When entering dimensions for route segments you can only type numerical value to start the dimension dialog, then you need to delete the value and you can type a parameter name but the dimension is changed back to a fixed value instead of being “parameter=dimension”. It seems to copy the value of the parameter like “d22=30mm” instead assigning the parameter to the dimension like “d22=vb”. I import parameters from xml for each style/size so while dimensioning I use items like “vb” (valve ball), or gp (gap), or “e” (tee and elbow) to dimension distance between nodes based on what goes into that node ,ball valve, tee, elbow, etc. 24. Constraints are not always visible for nodes. In the next image the node is coincident with the blue segment (extension of “fx:132”), and I can’t remove this constraint. ON/OFF switching of show constraints doesn’t fix it. Notice that 3D/Move Rotate is missing in the contextual menu because of the constraint being present but I can’t select it and delete it. 25. Need to be able to change orientation plane for multiple dimensions while in isometric view. Right now you dimension, right click, Annotation Plane, Show All Part Work Planes, choose a different plane, click to place dimension (“spacebar” is not always working, see below). We need to be able to select multiple dimensions, and change orientation plane for all at same time. 26. Need to be able to do Chain Dimension for isometric views with option for Annotation Plane. Right now we need to manually dimension each route segment and choose annotation (“spacebar not always working, see below) plane which is very time-consuming. 27. Make “SPACEBAR” work all the time for quick changing annotation plane while dimensioning Isometric drawings. Next I am showing how it’s meant to work and that sometimes it’s not and you need to manually specify work plane annotation. It’s not always working while selecting segments; you need to play with selecting segment end points. 28. Exit without saving still saves changes. If you use change size on pipes and then you close without saving it still saves the file, even if you shut down inventor to clear its cache memory and start a new session, the changes are persistent. 29. Decrease the length of the generated files and folders for any design accelerator, tube and pipe, frame generator, FEA items. It’s so easy to pass the 256 accepted characters in Microsoft Windows and you end up with all sort of problems, like unable to access and recover parts. 30. While moving equipment around some routes go into “Violation” mode and the only option is to CANCEL the command which will undo your work, and to edit the route braking constraints or deleting dimensions first. This is somehow related and really a continuation of the first one, so even if the route goes into “violation” the operation should be permitted to finalize and let the user change the route manually later in order to fix it. Items 31 to 34 added to the list, please vote on the idea station. 31 - make the 3D orthogonal route tool from Tube and Pipe, generally available in 3d sketches. Countless times I've created routes and used them as skeletons for Frame Generator. 32 - If you select an existing component and use place fitting to place it again "Change Fitting Diameter" becomes inactive. You can get it active by using Change Size, You don't need to actually change size just click ok in the window and "Change Fitting Diameter" becomes available. 33 - Why isn't "Delete" key working on components and you need to right click select Delete to remove fittings. This is standard in AIP except T&P. And why can't you delete more than one component like standard AIP. 34 - Make "Repeat last command" available for all commands. I use space (or enter) to repeat last command (just like Autocad) but it's not seeing all commands used, THE MOST IMPORTANT ONES i will say: "Edit Fitting Orientation", " Change Fitting Diameter", "Edit Fitting Connections". etc. It's like these were never used. 35 - Prevent fittings from changing orientation when doing operations like "Change Fitting Diameter". Chris Benner has reported this before. 36 - Fix default focus on "Connect Fitting" to "OK" so I can press ENTER to accept the way CANCEL revokes the command at any time just like in all the other commands. I don't want to hunt with the mouse but press my ENTER or ESCAPE thumb buttons on the mouse to finalize the command. Being a bit picky here, but it's all about productivity. Please check other commands as well, don't wait for us to report them one by one. 37 – Allow self intersecting routes to populate. Give us an option to accept or cancel when the warning occurs. As you can see, in the end the route will not self-intersect but I am forced to edit dimensions several times in order to complete this (waste of time). 38 – “Change Fitting Diameter” on components that are not iparts or CC items will restore the original fitting and increase its size. If a part Diameter cannot be changed then ignore it and don’t change it. 39 – Give us a “Match Properties” function like the one in the drawing for “Copy Dimension Properties”. On the same principle if you right click when the command is active you get a “Settings” menu where you can choose what to copy: Material, Appearance, Orientation, Diameter, Connection (distances). The Orientation (rotation) is going to be the hardest but I suggest using connection 1 (they all have at least 1 connection) as the rotation axis and Z axis as direction. 40 - STOP Changing orientation for fittings ! just like 35, different situation. I am only inserting a flange why do you feel I need the flow meter rotated 180 degrees? 41 - STOP the pointer from jumping uncontrolled between two possible connections. I can only hit escape and find other means of connecting the fitting. 42 – When using Change Size on pipe segments the screen doesn't refresh so you need to pan, zoom or run a different command to get the screen to refresh and show the changes. 43 – Because of item 4 “Fully constrained sketches go crazy when inserting a single node” and to speed up quick designs we would need an Auto-Dimension / Auto-Constraints option just like in regular sketch. End routes if not connected and hanging up in the air they should be dimension to any visible planes (included geometry) but if at least one end point is connected then dimensions and constrains should be enough to create a fully constrained sketch. 44 – When entering angle on routes of type“Tubing with Bends” the dimension is not added to the route. You need to manually dimension to get the angle to be persistent. 45 – When doing routes of type “Tubing with Bends” and you change direction to 90 degrees a perpendicular constraint should be added between consecutive pipe segments (skip the bend and have them perpendicular to one another). Now you need to add it manually not like on regular routes where it's added automatically. 46 - Routing from 3d points gives only one direction (arbitrary too). How can a point have a single routing direction? Give us the triad when starting routes from 3d points to choose direction. Use the work point inputs for the triad alignment. On any other points this is working just fine. 47 - When constraining routes to 3d points (included geometry) the route goes in to “Violation Mode” with the error “The route is not perpendicular to a circular edge”. I don’t care/need to have a circular edge to start a route; points are as good as any to start a route. This error makes no sense. 48 - Give us an Equal “=” constrain to lock similar pipe segments instead of dimensioning them. I work a lot with mirrored routes (deriving route would be too complicated) so an equal constraint would really help. 50 – Sometimes when moving equipment around the fittings don’t move with them. You need to edit each fitting connection and redefine the connection to get it to update and move. 51 – When you edit a route some fittings change rotation and report wrong angle. The original valve reports 0 degrees just like the new one I am placing but they are obviously at different angles. The pipe is correctly aligned; I have checked the origin planes and they match those on the new valve. 52 – Route construction lines should be visible inside the route sketch only. As soon as you exit the route they should be off. 53 – Route construction lines should not be visible in the drawing when selecting ”Include Route Centrelines”. I understand why some might need them so give us another option to “Include Route Construction Lines”. 54 – When you check out from Vault a T&P project and you edit it, Inventor will sometimes replace/create pipes but the old ones are still checked-out to you and then you need to find them and manually run undo check out. I think this need to be done automatically with each replace. 55 - Allow assemblies to be authored as T&P fittings, further more on the authoring info we should be allowed to copy or link authoring info from parts. This way if I change size/replace parts in the assembly the authoring info updates automatically. 56 - Allow change construction lines to normal and vice-versa on the fly just like in any regular sketch. This will in fact change what gets populated and what doesn’t just like now based on line type. 57 - Allow construction lines to be created freely as normal lines anywhere I need. At this point you can only create them from existing nodes. 58 - Derived parts should get T&P authoring information from base component, this way we can actually use iparts and shwrinkwraps. If you derive a component manually then in the derive settings window we should get a check radio button that will allow the authored info to be passed over to the child. 59 – We need to be able to retrieve dimensions of the routes just like on any normal parts. Furthermore we should be able to modify model geometry from those retrieved dimension like on any regular part. 60 – Fix the sketches for bent segments. Sweep segments don’t have constrained and dimensioned sketches so the Change Size on the pipe doesn't produce any results until you manually constrain and dimension the pipe sketch. The time required to do this makes it almost impossible to work with. 61 – Remodel T&P fittings in Content Center, they have been brought over from centuries ago and never got updated. Some of the elbows have discontinued faces creating weird models and high computing time when exporting to neutral format or sending other software like showcase. Instead of the 3 revolve with gap you might do it 2 sweep not gaps. 62 - If you have a lot of connected fittings and you want to place them all again in a different point you need to place then one by one. The place fitting command should work on grouped fittings asking you to constrain just the top parent component of your selection to which the others are linked. This should work similar to copy paste inside assembly, where we get automatic constraints (connections). Note: you can use copy / paste (no right click menu just CTRL+C and CTRL+V) and even thought the fittings are connected they don't update, move to new location once you connect parent fitting. 63 – I am not even sure what this error is but can we have it fixed please. Dimensions have confusing values until you actually click to place it. Most of us don’t click if the preview is not showing the correct result. 64 – This is more of a 3D Sketch problem but it needs fixing. On 2D sketch you can right click a line towards the end and choose Delete Coincident Constraint to release it. I would like to have the same option in 3D sketch so I can disconnect a pipe segment and connect it somewhere else. Manually removing constraints is not always working. See point 24 “Constraints are not always visible for nodes”. 65 – I think this is similar issue with 50 and maybe fixing one will solve the other. Fittings don’t move with the equipment or the route. I am editing the route and the flange doesn’t move. I need to use edit fitting orientation to force update it (all I do is press Spacebar to change direction twice to get it right again). 66 – Unions, coupling and connectors specified in the style can’t be reoriented. The change fitting orientation is not available. If you use place fitting on same element the edit fitting orientation becomes available. 67 – Please use the hose template supplied in Content Center. It is pointless for us to publish hoses if you’re not going to use the CC model to generate hoses. Placing from content center works fine but T&P creates new part and copies only some parameters like ID, OD and iproperties of the original model. The gray hose it the T&P generated file while the colored one was generated using place from content center. 68 – Just like in the case of tubing with bends the sketch of generated hoses needs dimensions and constraints. I cannot change size of the hose independent of the style if I see fit. In the animation you can see that I need to dimension and constrain the sketch to make it update size. 69 – Allow us to import TP style with missing CC families. If the family is no longer in CC don’t skip the import, I will modify the style and appoint a new family. I don’t want to recreate all the styles for hours but rather choose a new family and be gone in minutes. 70 – Give us the option to move/restructure fittings in the browser. The results are random and you need to drag other parts around your fitting to restructure the browser pane. Adding them to a custom folder is arbitrary as well; it seems that the group you try to move can be moved only if the first fitting in the selection is movable. ?!?. 71 – Please turn hose 3D sketch visibility OFF by default. The route can be visible but the hose 3D sketch is visible as well and I can’t see why anyone would need that especially in cases like mine where I have clear tubing. 72 – Allow all fittings to be used with Insert Fitting command because only some will permit insertion (Content Center only maybe?!?). I need to insert a standard fitting, and then place my fitting on top of that to get it to work; a lot of extra steps if you ask me. 73 – Placing an already existing library fitting (not CC) will trigger a “do you want to check it out of vault?” question. What’s placing got to do with checking it out especially since the fitting exists in the assembly. 74 – On consecutive inserted fittings while rotating a fitting the ones that follow should only rotate IF the connection is of type flanged where the bolt holes need to match. On connections like welded, clamped, joined, etc. the fittings that follow should not rotate. 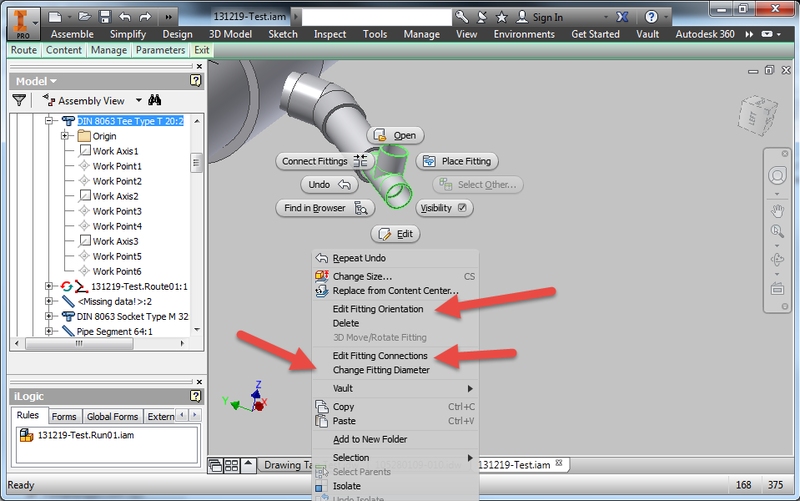 However as mentioned we need to be able to select multiple fittings and choose edit orientation. If it’s too difficult to implement then only rotate the ones with similar connection orientation (vector direction).